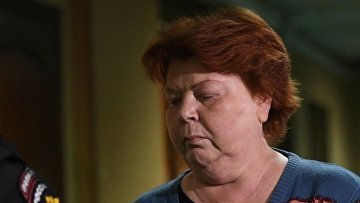 Ex-Seventh Studio chief accountant to stay under house arrest until July 19 | Russian Legal Information Agency (RAPSI). MOSCOW, May 17 (RAPSI) – The Moscow City Court on Thursday extended house arrest for ex-Seventh Studio chief accountant Nina Maslyayeva, a defendant in embezzlement case involving the Gogol Center theater director Kirill Serebrennikov, until July 19, the court’s press office told RAPSI. Hearing on a motion to extend house arrest of another defendant, former head of the stage company Yury Itin, has been postponed until May 21. On May 14, the Investigative Committee took decision to release and put ex-general producer of Seventh Studio Alexey Malobrodsky under travel restrictions because of his health state. In late April, the Basmanny District Court of Moscow extended house arrest for Serebrennikov and ex-official of Russia’s Culture Ministry and current director of the Russian Academic Youth Theater Sophia Apfelbaum until July 19. Serebrennikov was arrested in late August 2017 and then placed under house arrest. In early November, Moscow’s Basmanny District Court seized assets belonging to Serebrennikov including apartment, car, and money in the amount of more than 360,000 rubles ($6,000), over €60,000, and $4,000. Investigators believe that he was an organizer of the budget money embezzlement. He allegedly created Seventh Studio stage company to actualize the Platforma project for promotion of art and invited other defendants into the organization. The defendant denied wrongdoing. Investigators claim that Itin, Malobrodsky, and Maslyayeva were falsifying data for the Platforma project’s plans in 2011-2014 on request of the theater director. This data was provided to the Ministry of Culture as the rationale for financing from the state budget. Earlier, Maslyayeva has testified against Serebrennikov. She said that Serebrennikov, Malobrodsky and Itin organized embezzlement of money allocated for a cultural event. Serebrennikov and Malobrodsky cashed the money with the assistance of Maslyayeva. The woman also said that she entered falsified data in financial reports. Apfelbaum has been also arrested and put under house arrest on embezzlement charges. According to investigators, from 2011 to 2014, she signed contracts on state grants in the amount of more than 214 million rubles ($3.7 million) with Serebrennikov’s Seventh Studio on behalf of the Russian Culture Ministry, and provided further agreement of received reporting documents, which contained overstated information on quantity and cost of the held events. Thus, she has abetted the embezzlement of about 68 million rubles ($1.2 million) by Serebrennikov and his alleged accomplices, investigators claim. Apfelbaum admitted that she controlled the movement of cash but pleaded not guilty to embezzlement. One more defendant, producer Yekaterina Voronova, has been arrested in absentia and put on the international wanted list.